AFTER scuttling talks on transfer of technology in the recently concluded climate change conference in Cancun, the US now wants China to stop its clean energy programme. The US, on December 22, filed a complaint with the World Trade Organization (WTO) that China is unfairly helping its domestic wind power equipment manufacturing industry with soft loans, cheap land and subsidies, thereby giving it a competitive edge. This is despite the fact that the US has its own green energy development programmes which run into billion of dollars. The United Steelworkers, North America’s largest industrial labour union, had filed a 5,800-page petition in September 2010, asking the Obama government to investigate whether China had broken any international trade regulations. The US is targeting a Yuan 6.63 billion (one billion dollar) Chinese fund that aims to help domestic manufacturers build up their equipment inventory and substitute imports from other countries. Import substitution subsidies are prohibited under the WTO as they are harmful and “inherently trade distorting”, US Trade Representative Ron Kirk said. “These subsidies operate as a barrier to US exports to China,” he added. 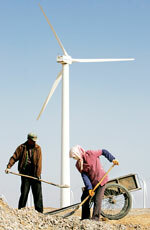 In midst of this conflict is the 2008 Special Fund for Wind Power Manufacturing Sector in China, which provides Yuan 600 (US $91) per kiloWatt to turbine and wind power equipment manufactures to cover the research and development cost of new wind power equipment. The grants available under this fund range between US $6.7 million to US $22.5 million. World Bank’s 2010 Development Report, states that at least US $300 billion have been paid as fossil fuel subsidies and the only way to correct this distortion is by subsidising renewables, Kevin P Gallagher, a professor of international relations at Boston University, said. The trouble is with the WTO process which does not allow developing countries to support research and development. A window should be opened up for the same along with support to regional inequality and environmental protection. But the US actions may not be able stop Chinese subsidies in the short run. Madhukar Sinha, professor of WTO Studies at the Indian Institute of Foreign Trade, said trade disputes are complex and can take about 20 months to be settled. The Chinese ministry of commerce said in a statement that these measures are “consistent with WTO rules” and will help “energy conservation” and “environmental protection”.